Archive » Crazy for avocados: but what does it take to get them onto our plates? Crazy for avocados: but what does it take to get them onto our plates? If your local bakery-café doesn’t have at least one sandwich that features avocado, it might not survive very long. What self-respecting fusion restaurant in any large post-industrial city doesn’t offer guacamole as a standard side dish in this day and age? Newspapers around the world have dedicated thousands of column inches to the green superfood, and all the benefits of eating it regularly. Bars dedicated to this wonderous fruit have opened in New York, London and Milan. It’s versatile, chic and easy to work with: eat more avocados, and we’ll be healthier and more beautiful. It is really so simple? What’s the real story behind the marketing? Slow Food Italy has already spoken about the problems surrounding avocado production in Mexico this year, but today we examine the situation further south, in Chile. To be clear, this isn’t an attempt to demonize the avocado as an ingredient, but to understand the food system which provides it, and ask ourselves if that is the kind of system we want to participate in. When we look at all the real costs of the avocado, not only in terms of its market price but its environmental and social impact on the communities where it is grown, will we still be so hungry for it? 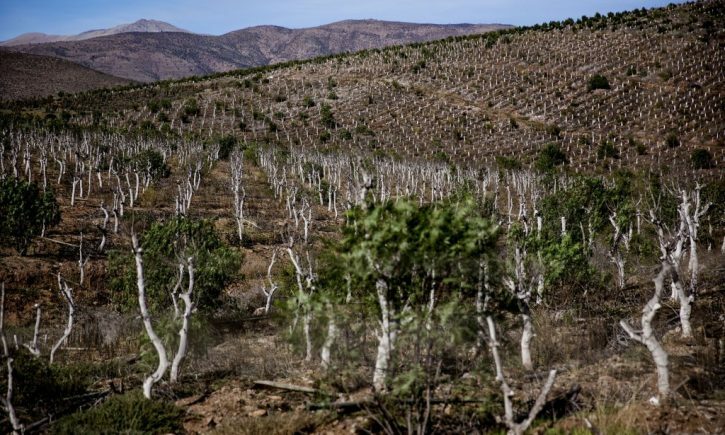 In a report (in Italian) for Internazionale magazine, independent journalist Alice Facchini tells the story of the severe problems behind the avocado industry in Chile, where their cultivation is sucking the province of Petorca dry, and forcing the people that live there to adopt drastic solutions in order to satisfy that most primary human necessity: to satisfy thirst. Does our guacamole taste the same, thinking about its true cost? And while we can’t take all the world’s ills onto our own shoulders, we can at least stop to think about what we choose to eat. “Avocados travel around 15,000km to arrive on European supermarket shelves, polished and nicely displayed. To conserve them, they must be conserved at a temperature of five degrees centigrade, so they are transported in refrigerated cells. From the plantations, the crates are loaded onto big trucks that bring them to Chilean ports, mostly Valparaíso and San Antonio, where dozens of cargo freighters await them. The journey across the sea lasts three weeks: the boats power up the South American coast past Peru, Ecuador and Colombia before crossing the Panama canal and the Atlantic and finally arriving in Europe, in the ports of Algericas in Spain and Rotterdam in the Netherlands. The multinational companies behind the supply chain may be arrogant, but they rely on our disinterest in the origins of our food. As long as consumers are happy to ignore the wider social, environmental and gastronomic context surrounding the fruit stand in their supermarket, the battle is all too easily won and lost. There is a bigger picture here, and we do not have to look very hard to see it. But a little effort is required. Otherwise, we can cannot continue to fill up our shopping carts and order our next avocado bagel with easy nonchalance. Isn’t it time we started to take a little more responsibility? What role can food play in reducing inequality?